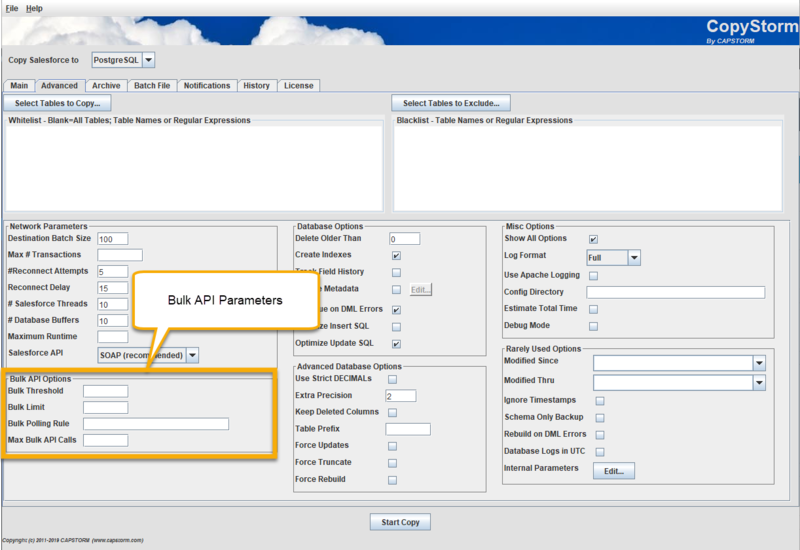 The Bulk API parameters section controls when CopyStorm will use the Salesforce Bulk API rather than the default SOAP API. A Salesforce organization has a limited number of Bulk API calls per 24 hour rolling period. Be aware of your limit. The SOAP or REST API will almost always perform better than the Bulk API if performance is measure in the amount of time a user has to wait for a backup to complete. We suspect that this is because Bulk API queries run on a reduced priority thread within the Salesforce infrastructure. If set to 0 then CopyStorm will always use the Bulk API (when possible — not all tables are supported by the Bulk API). If set to 50000 then CopyStorm will switch to the Bulk API after 50,000 records have been processed for a table. To reserve Bulk API calls for tables where it may help, Capstorm recommends setting this parameter to 50,000 or above. Bulk Limit No Controls the number of records that will be retrieved with each Bulk API call. A larger value will cause each Bulk API call to take longer but minimize the number of Bulk API calls. If this parameter is not specified it defaults to the SOAP Limit for the current table. Bulk Polling Rule No Sets the polling rate CopyStorm uses to check if a Bulk API operation has completed. The format of this parameter is a comma separated list of numbers where each number indicates how many seconds to wait between each poll of Salesforce. Poll Salesforce after 1 second the 1st time. Poll Salesforce again 3 seconds after the 1st check. Poll Salesforce again 5 seconds after the 2nd check. Poll Salesforce again 10 seconds after the 3rd through 5th check. Poll Salesforce every 30 seconds after the 5th check. Max Bulk API Calls No The maximum number of Bulk API calls that will be used in a single CopyStorm session.